A Nanaimo resident is helping to bring hockey from one island to another. Donovan Tait is a Nanaimo RCMP sergeant, and in his spare time, he’s a scout and advisor with the Jamaican Olympic Ice Hockey Team. Tait has been involved with the organization behind the scenes for a number of years, but only recently has the executive decided to publicize its efforts. A Jamaican U20 team will participate in a hockey tournament in Nova Scotia next month and Tait will be part of the contingent. Tait was born in Canada and grew up on Vancouver Island, but lived in Jamaica as a child, has Jamaican heritage and travels there at least once a year. “My mom and dad, it was very important to them that me and my brother and sister really knew Jamaica and were always connected there,” he said. Tait is taking on a few different tasks with the Jamaican Olympic Ice Hockey Federation, including publicity. He was in Jamaica last month and found himself on a radio show talking to a caller about a Zamboni. “When it gets to Jamaica, it’s going to be the Jam-boni,” came the reply. Jamaicans like to have a laugh, Tait said, but the hockey team isn’t meant to be a joke or a gimmick to sell T-shirts – the group is earnest in its efforts. While he was in Jamaica, Tait met with the federal minister of sport and with the vice-president of the country’s Olympic committee. Jamaica has been granted associate-member status with the International Ice Hockey Federation, though it can’t become a full member until there is an ice rink in the country, a league and youth programs. Tait has had discussions with various groups and thinks it will take private investment to build an arena; he suggested a partnership with a resort might be realistic. “If we were to build a rink, I think there’d be a lineup of kids wanting to try and compete on an Olympic stage,” Tait said. For now, the hockey team is mostly comprised of Canadian kids who have Jamaican heritage. Next month’s event in Nova Scotia isn’t just a showcase, but is meant to celebrate diversity in sport. The tournament is a Canada 150 project and will recall the Coloured Hockey League that operated in the Maritimes from 1895-1930. Graeme Townshend, who was the NHL’s first Jamaican-born player, is coach of the Jamaican Olympic Ice Hockey Team and Willie O’Ree, the NHL’s first black player is, like Tait, an advisor with the federation. Tait said it will be meaningful to see the team take the ice next month. His parents are “fiercely proud” of where they come from and Tait is “completely passionate” about Jamaican hockey. 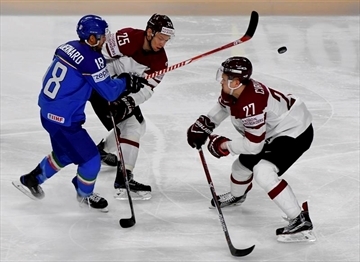 PARIS — Centre Andris Dzerins scored his second goal of the game with a little more than one minute left as Latvia beat Italy 2-1 at the ice hockey world championships on Tuesday to remain top of Group A, ahead of Russia. Although Russia has also won its three matches so far, it is in second place because one of those wins came after overtime and a shootout. They play each other next Monday, and both still have to face the United States. Italy had pushed Slovakia to overtime in a narrow defeat on Saturday and proved resilient again, even taking an early lead through left winger Marco Insam. Dzerins equalized in the 12th minute of the first period on a power-play, and for the winner was set up by winger Roberts Bukarts with 58:41 showing on the clock and overtime looming in the German city of Cologne — which is co-hosting the tournament with Paris. Denmark beat Slovakia 4-3 in a shootout in the other Group B match, with Morten Green getting the game-winning goal. Denmark moved off the bottom and pushed Italy into last place. Over in Group B, Ken Andre Olimb help set up the first goal for his older brother Mathis Olimb and got the next one himself as Norway beat Slovenia 5-1 in Paris. Ken Andre teamed up with left winger Patrick Thoresen on the goal six minutes into the first period and then scored himself with about 15 minutes on the clock, with Thoresen assisting again. Kristian Forsberg made it 3-0 at the end of the first period. Forward Aleksander Reichenberg scored the fourth near the end of the second period. Robert Sabolic pulled one back for Slovenia, which has lost its three games so far, before Thoresen added the fifth goal — with Ken Andre assisting. Thoresen had starred with two goals and an assist when Norway downed France 3-2 last weekend. Third-place Norway and Switzerland have six points each — with the Swiss ahead on goal difference and in second spot place behind Canada. The French are in fourth and in contention for the quarterfinals. In Tuesday night’s other match, Switzerland missed out on a third straight victory after losing 4-3 to France in a shootout. France forward Stephane Da Costa scored the only goal of the shootout with a neat backhand flick from an angle. France was indebted to its 41-year-old goaltender Cristobal Huet — a member of the Chicago Blackhawks team that won the Stanley Cup in 2010 and a former NHL All Star nominee. Huet saved all three shots he faced in the shootout, including one great sprawling stop to deny left winger Vincent Praplan on Switzerland’s second attempt. France was short-handed — defending on a Swiss power-play — when it fortuitously took the lead after three minutes, as defender Yohann Auvitu’s shot struck a defender’s leg, hit the post and rolled in. Praplan netted twice early in the second period — with fellow winger Denis Hollenstein assisting on both — to put the Swiss up. Da Costa equalized early in the third period on a power-play, assisted by Auvitu. Right winger Anders Ambuhl put the Swiss back in front in the 53rd, before forward Anthony Rech levelled with four minutes remaining. The Swiss play last-placed Belarus on Wednesday, and the French face Canada on Thursday. There are eight teams in each group with the top four advancing to the last eight. Canada is bidding for a third straight title and has three wins, with 17 goals scored and three conceded. Canada is looking to equal Russia’s tally of 27 world titles — 22 of those as the Soviet Union. The United States, which has won two and lost one, takes on Italy and Germany plans Slovakia in Group A Wednesday.